Hey all, Phil here. 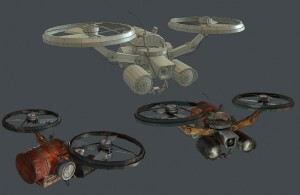 As one of the 3D Generalist on the team I was tasked with creating a 3D game asset of the REBEL DRONE. Hey all, Phil here. 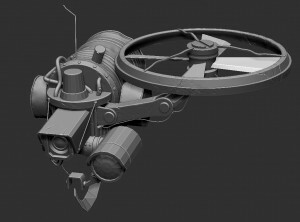 As one of the 3D Generalist on the team I was tasked with creating a 3D game asset of the Rebel Drone. After a meeting with my Lead, discussing certain aspect of the concept (Shown in a earlier blog post) it was time to begin the process. I began by blocking out the basic shape of the model. These objects were not game ready but would aid me when sculpting detail in Zbrush which will serve as high res detail for the low poly model which will feature in the game. 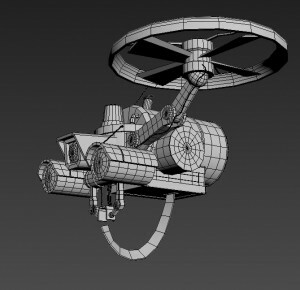 Once the High poly sculpt is completed, I then move onto creating the actual in game model of the Drone. After another meeting with my Lead and a few alterations I move onto the texturing process. Where I match the appearance of the materials seen in the concept. I also texture additional damage and Grime so to greatly reinforce that feeling of scrapped parts. If you have any questions about the process, then please feel free to ask away below and I’ll try my best to get back to you.